I spent a large part of my weekend working on the new blog layout and fixing up old blog posts, stamping old photos, re-sizing photos, and pulling my hair out over Internet Explorer compatibility. Right now I estimate that layout wise I’m about 50% done and as for fixing up my horribly unorganized categories, that’s probably at around 10%. Eventually when I’m done, each archive and category page should have thumbnails and set excerpts. Funnily enough, I had no idea that excerpts even existed before I started all of this. Today is when I’m supposed to start Weight Watchers, but I haven’t signed up just yet. I made this bento this morning to start myself off on the right foot. I had to boil the egg and potato and pasta, so with all the cooking involved, this took me about an hour. In the bottom tier I have garlic shrimp with whole wheat pasta tossed with shelled edamame and corn. 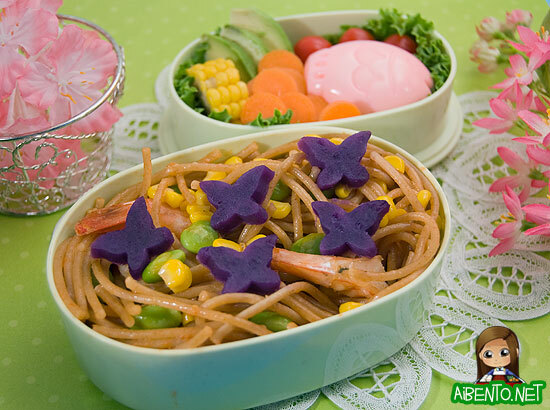 I topped the pasta with sweet potato slices cut with a food cutter set available on J-List. I lined the other tier with green leaf lettuce, then added a small wedge of corn, three small slices of avocado, a baby carrot cut into carrot coins, a fish shaped boiled egg, and three little grape tomatoes. Here’s a closer look at the potatoes so you can see their beautiful purple color. My dad sent a bunch of them for Christmas and I boiled it this morning with my eggs. It made the shells turn brown, but none of the eggs cracked, so it was all good. 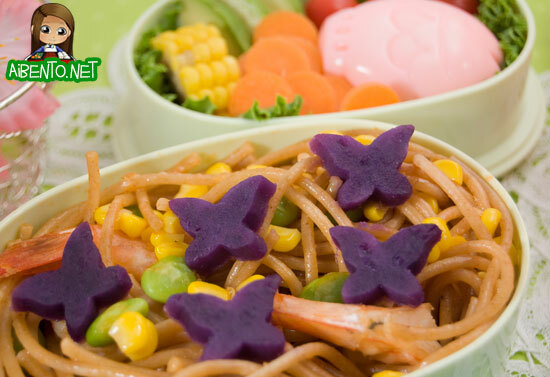 I packed it in a green bento box that I picked up at Don Quijote one night while shopping. I can’t remember what I paid for it, but it’s only $3.80 at J-List, which makes it a nice starter box if you’re already ordering some accessories to start bentoing. I don’t know how to make whole wheat noodles more “bendy”. I boiled them for what seemed like forever (thus the long bento prep time) and they still don’t curl well like normal noodles. Are they simply incapable of doing so? Is there some trick to it? I wish I’d thought to put something into the pic for scale. 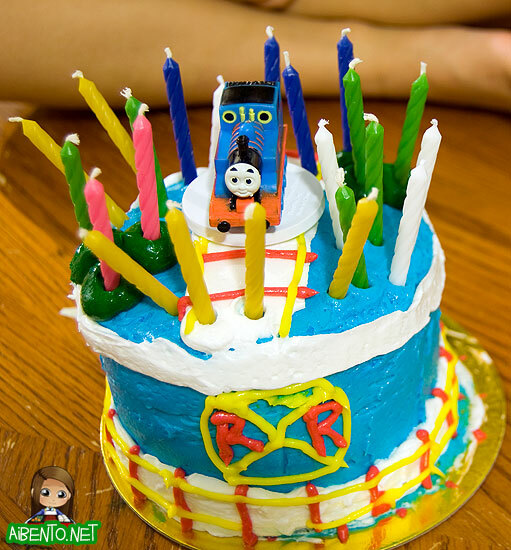 Anyway, the kids got a little excited and wouldn’t stop putting candles in, so now Buddy is apparently 20 years old. I cut it into fourths and had my last giant piece of cake for a while. I’ll miss you, Safeway cakey goodness! I’ll eat you once in a while, I promise! 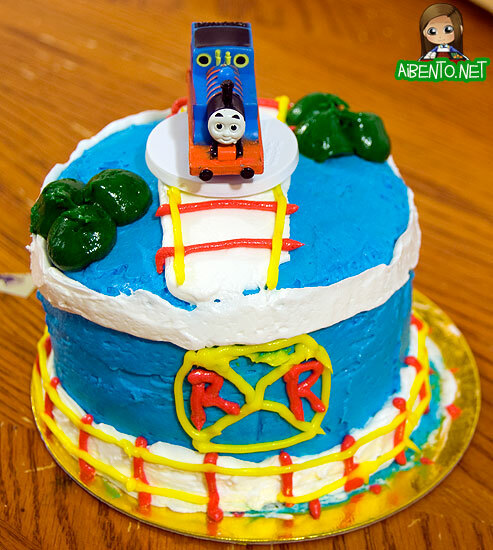 This little cake was just perfect for three adults and two kids. No leftovers! Woohoo! Someone commented last week, asking how I made my little photo stamp. 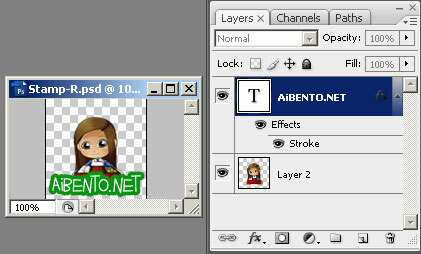 To give some information, I use Photoshop CS3. I took the image you see in my logo and added a text layer on top. Then, I added a Stroke effect. To do this, you double click the text layer (not on the words) which will bring up the Effects menu. 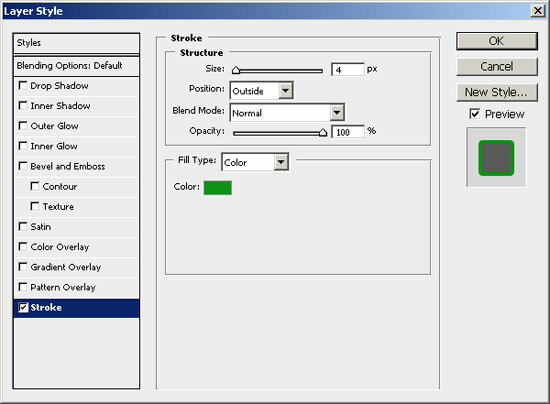 Click the checkbox for “Stroke” and then click on that option to bring up the options for that effect. I selected the color green, then made the stroke size 4 px. This added the green outline to my text in white font. To add this to my photos, I open the .psd file of the stamp and drag the two layers over to the photo. All done! Let me know what you guys think of the new header!